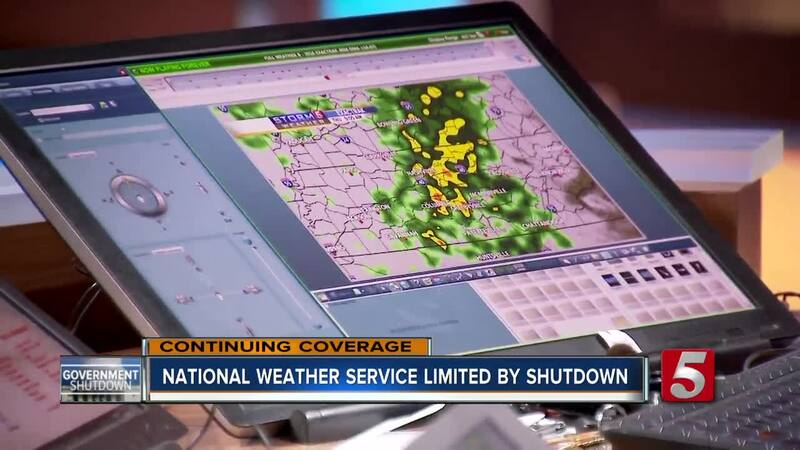 As the government shutdown continues, the National Weather Service is limited in what they're able to do. The terms of the shutdown allow them to continue to forecast the weather, but they aren't paid, they can't do any community outreach, and they can't conduct any research. NASHVILLE, Tenn. — The government shutdown has impacted numerous departments of government, and that includes the National Weather Service, which still has their employees at work, but those employees are limited in what they’re allowed to do. “Weather forecasts will still come out, if there are any weather warnings that need to be issued, our friends at the weather service will stay on top of that,” Lelan Statom, senior meteorologist at NewsChannel 5, said. What is limited is the outreach and research aspects of the National Weather Service. “I kind of consider the National Weather Service services as kind of a circle of services, and that’s kind of cut in half. It’s almost like one of our hands is tied behind our back, because we’re not able to do that outreach,” Jason Wright, senior forecaster and representative of the National Weather Service Employees Organization, explained. Outreach can include training storm spotters, programming weather radios, and workshops with local media. Wright said that’s a big part of their job that they’re passionate about, and it’s been taken away. Wright said despite not getting paid and being limited in what they can do while at work, the meteorologists and other employees will continue to show up for work through the government shutdown. In addition to limiting outreach in the physical sense, Wright said the National Weather Service is also limited in what they can discuss on the phone and through social media, being told they have to stick to short-term weather forecasts.